I enjoy this topic a bit. Please don’t take this as science, or fact. This is purely speculation and discussion about market share. The topic itself is rather complex. You can view it from the mathematical/statistical point of view, or from the business/marketing point of view. Both have a very different (yet similar) angle on the topic and view things a bit differently. Because of my interest in the business angle, I’ll lean slightly more towards that. Firefox’s share shrunk to 8.07 percent from 8.71 percent in June, while IE grew its market slice to 87.20 percent in July from 86.56 percent last month. …He pointed out that Apple Computer’s Safari browser grew most, increasing its market share 2.13 percent from 1.93 percent. America Online’s Netscape, which once ruled this market, slid a bit to 1.50 percent from 1.55 percent. Opera Software ASA’s Opera came in fifth with a 0.49 percent market share. The point of the below graphs is to illustrate how much this really means in the grand scheme of things (from what we can tell based on the available data). As you’ll see, there’s almost no difference. Simply because were talking about a little more than a half of a percent. With IE still holding over 85%, a fraction of a percent is pretty meaningless to them. It’s not like they had a big gain. 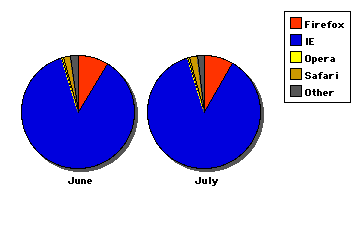 August is a vacation month – Simply put, lots of people are on vacation, and away from their computers. This is especially true for students, and younger adults. This is important as this demographic is key to Firefox 1.0 success. If you look around, some of the best marketing for Firefox took place via grassroots efforts like Blogs and such. It’s obvious the net slows down a bit in August. Everything from websites to online forums seem to slow down a bit as people take some time off (this blog is a perfect example if you look at posts per month). Factor of 1.5 – that’s right. Firefox 1.5 isn’t to far off, and you know what that means? Yup, the lull before upgrade season. Growth will slow thanks to people saying “I heard it’s coming soon, I’ll just wait”. Then of course you have corporate deployments who don’t want to bother with a version that will be outdated soon. If I were them I wouldn’t really push 1.0 at this point either. I’d hold until 1.5 is released, then deploy that. Marketing Slowdown – yea, that’s the big one. Why? Because of the above two reasons. SpreadFirefox is in a bit of a transition right now. It’s hard to say for certain, but I’d guess at least part of it is simply the fence leaning. What does that mean? Well with anything, there are people who jump on board (if your reading this blog using Firefox, you likely fit in this category), and people who stay on their side of the fence (you IE people). Then there is the small percentage who don’t quite know where to go. They try things out, and go back to the side they came from (IE). This is a normal part of software transitioning. Remember back when Mac OS X 10.0 came out? We all had classic running in the background about 95% of the time? A few even stuck with classic (while having OS X installed). Then as we got more adjusted, Classic was running less and less. Until it became a rare situation (I only use it for SimCity 2000 these days), and occasionally Microsoft Office, since I haven’t convinced my student budget to purchase Office for Mac OS X (I use AppleWorks when on the Mac most of the time). So if September and/or October looks sour, it’s over? No. Not really. Take a look at Netcraft’s excellent survey of web server’s and you’ll see various places where you could have assumed that Apache would be turning sour, when in fact, it goes right on back. Oh how tempting that is. I will say this. I expect shortly after 1.5, there will be jump in users, a larger trend will take place among corporate users thanks to some enhancements, and just “not being 1.0” (many companies have policies against anything that’s “.0” simply because they view it as new and buggy). So I expect more corporate adoption. The problem with corporate adoption is that it can be a slow process (QA can take months). So that jump may start 3 weeks out from 1.5’s release, but may not be fully realized for a few months after. Hype. That’s really it. There was a lot of hype about Firefox taking over the web. That was good (in a way), but this is the downside of that. Now browser stats are all the rage. A year ago almost nobody cared about them. Now it seems everyone does. Firefox isn’t about a monopoly or fighting one. It’s about providing choice and innovation. That’s what it does. Firefox grows when it innovates and the rest of the industry doesn’t. Perhaps that’s really what browser stats gauge? 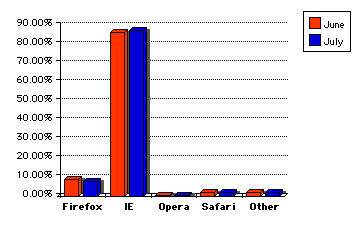 Market share is a measure of browser innovation and users acceptance (or disappointment). Yep, there’s that word again (“user”). It’s about the “user”, not the browser. Remember that. Blake has said this before. 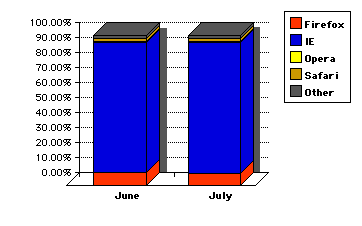 So yes, the statistical drop between June and July is pretty meaningless regardless of how you look at it. Try NeoOffice/J available from MacUpdate.com and VersionTracker! @Deacon: I’ve tried NeoOffice before. Not bad, just not very fast. IMHO it’s either AppleWorks, or Office X. at this point. OpenOffice on Windows is rather competitive against Office, but on the Mac, the OpenOffice product line just doesn’t cut it. @Anon: yes, that’s very true. I was trying to avoid the “it’s not our fault” argument, so I decided not to bring the IE 7 factor into play. I decided to be a bit conservative and assume it’s all about Firefox. IE 7.0 likely will have some influence. I doubt it’s really much at this point. Actually, IE 7.0 could cause Firefox to gain market share, as people still using older versions of Windows (98, ME, 2000) decide to switch from IE 6. @Martey: it’s hard to say, because some may go back to IE since it has tabbed browsing. What the end result is, I don’t know.